"Our talents" was an exhibition organized at the ZSMU Foreign Citizens Training Center. Young painters presented their drawings to other students and teachers. The organizers sought to reveal the creative potential and ability of foreign students to paint, thus forming empathy for people who need help. The exhibition featured paintings in various techniques, including academic drawings with pencil, graphics and watercolors. 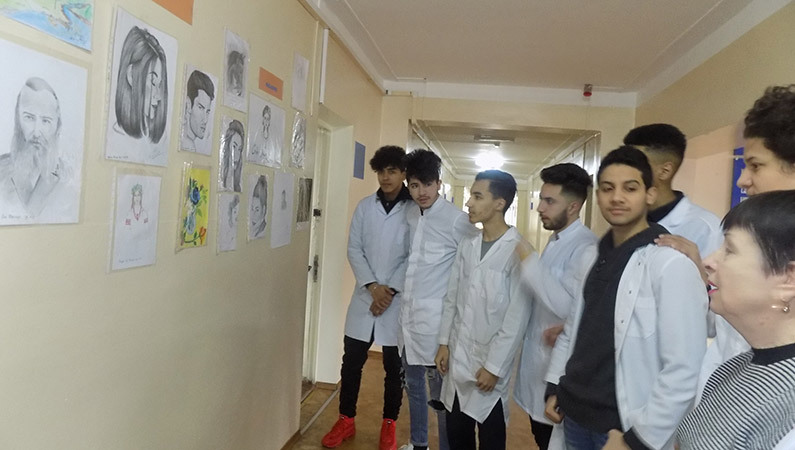 Not only the students of the Center, but also students of senior courses with pleasure viewed landscapes, admired women's portraits and still-life paintings, executed in the style of various artistic schools. The youth revealed their talents, thus passing their emotions and outlook. The exhibition aroused interest and approval from foreigners and teachers. Having examined artworks, many of them also expressed their desire to join the show of their creative achievements and take part in the exhibition. This creative exhibition duly complemented the complex of multifaceted work with foreign citizens, which is part of the educational process at the Center. All educational activities are subordinated to the formation in the youth of universal principles such as compassion, kindness, humanity. After all, such traits shape the personality of a future doctor, a pharmacist, and, without a doubt, they will need them.